Warner Bros. recently sent me the Vampire Diaries Season 1 to sink my teeth into. I had caught snippets of the show when it had been shown on the television but had always missed the time slot, so I was very happy to finally be able to see what it was all about. The Vampire Diaries introduces the audience to the small town of Mystic Falls and Elena Gilbert. Elena is grieving the loss of her parents and is finally picking back up the pieces of her life in a bid to find an assemblance of normality. Elena feels a huge responsibility to her younger brother in the wake of all that has happened since the tragic car crash that claimed both of her parent's lives and does everything possible to prevent him any further heartache. 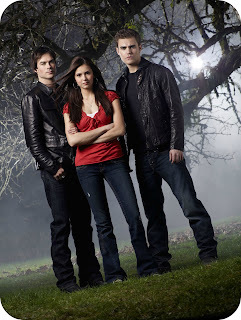 Elena is soon introduced to the delectable Salvatore brothers Stephan and Damon. Stephan and Damon are not your average brothers, they harbour a life long secret. They are actually vampires who were around when the town was first foundered back in 1859. Elena and Stephan are soon drawn together, and a passionate relationship starts to un-fold. It is not long before Elena senses that something is not quite right, could it be that distinct look in his eyes? Or the sudden animal attacks that are haunting Mystic Falls? You see the reason Stephan is so drawn to Elena is because she is the spitting image of his past love Katherine. Katherine was a vampire who both the Salvatore brothers held a flame for many, many years ago. With the arrival of Damon into Mystic Falls comes all of the sibling rivalry and drama that lead to them eventually going their separate ways for 15 years. Now they are face to face once again everything begins to unravel in a fast moving, action packed, blood sucking season one. I began to watch the Vampire Diaries last week, and it has resulted in many a late nights as I have become so engrossed into what may happen next, that I decide to watch one more episode...and then one more. It is a very fast moving drama that really will keep you on the very edge if your seat, in anticipation of what will happen as the series progresses. I am now on the Fourth disk and looking forward to see how they conclude the many exciting twists and turns of the first season, but it is safe to say that I will me be watching the next series. Season 3 has actually just been released for those of you who are up to date, but for those of you who love a supernatural mystery and have let the Vampire Diaries pass you by, then this really is a must watch. You can purchase season 1 on Amazon for £12.00 and I am sure you will not be disappointed with the goings on in Mystic Falls. 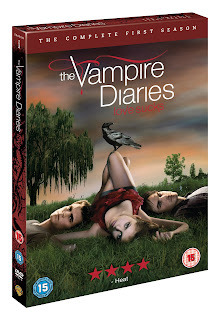 Disclaimer: I was sent The Vampire Diaries Season One for the purpose of this review, however all views and opinions are completely honest and my own.